Hilltop Nordic Center rents snowshoes as well as cross country skis. RICHMOND — New England ski resorts are always lamenting that no matter how much snow cover they have, business doesn’t pick up until Bostonians can look out their windows and see snow. Not us. We’d gladly forgo snow in the city in favor of driving out of town to visit snow, then returning to unobstructed on-street parking. Plenty of good snow escapes lie within a three-hour drive, and when the Christmas week storm dumped a fluffy load on the Berkshires, we tossed our snowshoes and poles into the hatchback and lit out for Hilltop Orchards. The orchard operation is part of a 200-acre farm that also includes Furnace Brook Winery and Hilltop Nordic Center, home base for 4 miles of groomed trails through the orchard and woods. From a visitor’s perspective, the three businesses are all one place, located in a modern building at the top of a steep driveway. (Park at the base if there’s fresh snow on the road and you don’t have four-wheel-drive.) It makes the perfect one-day getaway of the type we think of as Snowshoe Plus: some moderately strenuous activity with a reward at the end of the day. Snow sports are supposed to be fun, and the staff at Hilltop have an easy-going attitude that we find both welcoming and very simpatico. When we arrived about noon with deli sandwiches (purchased en route in West Stockbridge), the young woman at the wine-tasting counter agreed that it would be a splendid idea to enjoy our lunch in front of the wood-burning fieldstone fireplace. When we were ready to head out, manager David Martell went over the pros and cons of the trails, which had been laid out by former Olympic skier and biathlete John Morton. The nicely groomed loop trails are stacked on a hillside, and increase in difficulty the farther up they go. They feature well-grooved set track for skiers, but the groomed area is also broad enough for skate-skiers and snowshoers (not to mention family dogs) to share the paths. 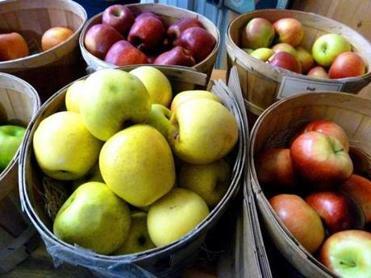 Hilltop Orchards had a limited selection of fresh apples remaining from the 2012 harvest. The first major snowfall of the season brought everyone out to play — from hard-core cross-country skiers clad head to toe in technical gear to families trying out snowshoeing and nordic skiing as a lark on a school vacation day. Although the same terrain suffices for both sports, cross-country skiing is a study in grace and economy, rather like sailing on snow in a nearly silent glide. Snowshoeing is the more visceral sport, a reenactment of the pleasure a small child gets from stomping around in mud puddles. Despite overcast skies, everyone seemed to be pumped for a good time. Morton’s trail design takes good advantage of the gently hilly forest that surrounds the apple trees, but we found ourselves captivated by the long rows of bare trees that seemed like a sculpture garden in the fresh snow. As Martell had recommended, we ascended through the orchard to the highest point — where the forest paths meet the orchard loop — and looked back down the sweep of the hillside. The long rows of apple trees seemed to point like fingers to the distant rippling line of blue-tinged mountaintops. Martell was right: The view really is phenomenal. The property, which sits nearly on the New York border, has been a farm since the middle of the 19th century. When it went up for sale in the 1980s, presumably to be subdivided for residential construction, the Vittori family stepped in to preserve the land for agriculture. They cleaned up the overgrown apple orchard, keeping key heirlooms like Wealthy, Milton, Rhode Island Greening, and Golden Russet. The elevated south-facing slope has perfect ventilation and sun exposure for apples, and in all, Hilltop grows 26 varieties as well as some pears and plums. In the fall, customers can pick the apples, although some varieties are reserved for wine- and cider-making operations. 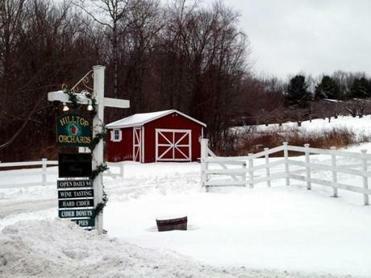 Hilltop Orchards in Richmond is also the home of Furnace Brook Winery and Hilltop Nordic Center. Hilltop presses upward of 150,000 gallons of fresh cider a year. Co-owner John Vittori got the bug for making hard cider early on, and went to England to study the process with some of that country’s commercial cider masters. In 1994 he introduced Johnny Mash, Hilltop’s flagship hard cider, which had two hillside trails named after it. Ultimately, hard cider led to wine-making and the establishment of the first farm winery in the Berkshires, Furnace Brook Winery, in 1998. 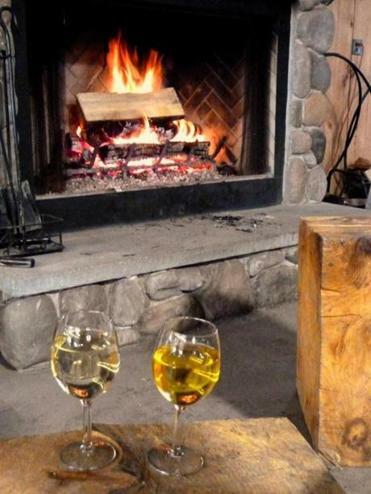 The stone fireplace at the Hilltop Nordic Center was a great spot to enjoy a glass of wine from Furnace Brook Winery. sweeter apple ice wine. Most of the wines have won medals at the Big E Northeast Wine Competition. So have the two estate-grown hard ciders: the original Johnny Mash and a more recent introduction, a French-style cidre. Rich and luscious with a hint of spice and just enough residual sugar, the cidre is our favorite of the Furnace Brook Winery drinks. “It’s made with Golden Russet apples. They have skin like a pear,” Martell told us, explaining that, like a red wine, the cidre is pressed, crushed, fermented on the skins, and aged in oak barrels. We took a couple of glasses and settled on the big leather couches in front of the fireplace. The cidre, we discovered, is a perfect pairing with the farm’s fresh apple cider doughnuts. 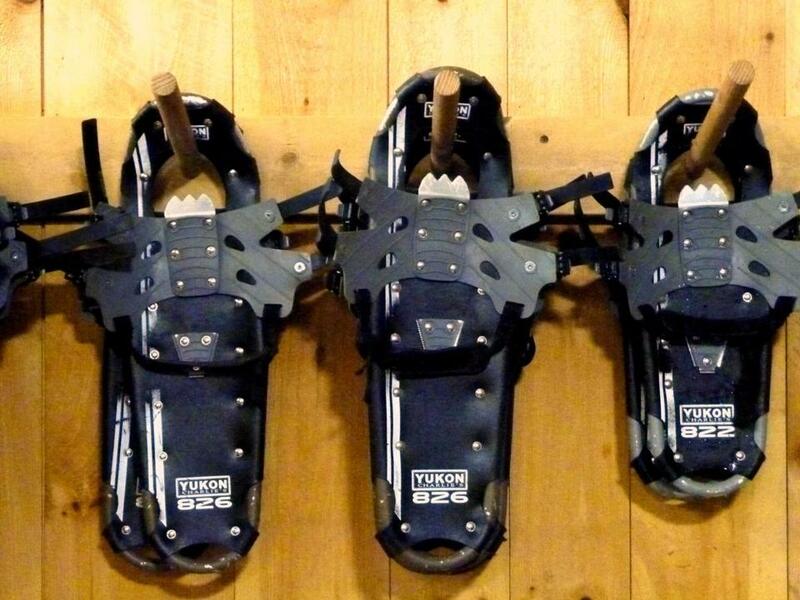 That’s what we mean by Snowshoe Plus. Patricia Harris and David Lyon can be reached at harris.lyon@verizon.net.